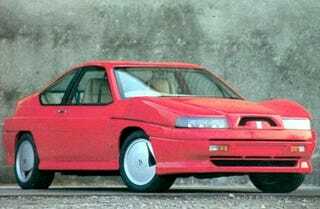 When we first saw a picture of the 1989 Autech Stelvio, we assumed it was some sort of hideous one-off Japanese concept car. It turns out the car is actually part of a limited run Nissan supercar designed by Zagato. Produced by Autech, Nissan's special performance company, the cars are based on what we know as the Infiniti M30 platform, but featuring a 320 horsepower DOHC V6. After assembly, the chassis were sent to Zagato to be fitted with the... unique bodywork. In addition to the late 80's lines, the hood clearly features something a bit different from the average car. What is it? As you can see in the picture above, it's a fender mirror that flares out from the headlights back to the driver's position. While an interesting idea, and we applaud the courageous use of NACA ducts, the executions is awful and the result is unfortunate. Zagato, which has made cars we love to look at sort of whiffed on that one. Even worse, the cost of one of the 200 cars produced was 18 million yen, approximately twice the price of an NXS-R when it debuted. Ouch.